Meet some of Australia’s leading military history groups at AIRSHOW 2019. The AGWA is a non-profit organisation comprising of men and women who care passionately about commemorating those who fell in the Great War of 1914-1918. The GMRG comprises a group of enthusiasts dedicated to educating and entertaining the public about the proud and distinguished military history of Australia, her allies and enemies. The LH&FAM is dedicated to the commemoration rather than celebration of war. The museum also highlights the often forgotten about utilisation of animals during all wars. The VMVC is a not-for-profit club run by enthusiasts of ex-military vehicles. Formed in the early 1960’s, today the club incorporates a wide variety of military vehicles, from WWII to present day. They are involved in a range of events including ANZAC Day parades, ex-service personnel tributes and vehicle displays. Wartime Living History Association Inc. Through education, role play and demonstrations the WLHG strives to bring to life past events. Although their main sphere of attention is WWII, the group also recognises other periods and geographical locations that have influenced us as a nation today. The 2019 ground display by the 39th Battalion – Kokoda Historical will highlight the service and sacrifice of those soldiers of the 39th who fought in the defence of Australia during the dark years of 1942. The Australian International Airshow 2019 will welcome a distinguished guest to be part of the Commemorative Ground Display on Saturday 2 March. 100 year-old ‘Harry’ Crick is the oldest surviving member of “Wangaratta’s Own” 2/24 Battalion which formed, trained and deployed to the Second World War from the Wangaratta Show Grounds. ‘Harry’ enlisted in the Army on 4 August 1940 and was chosen to join the 2/24 Battalion while they were at Bongellia to increase their numbers. He deployed to the Middle East on RMS Strathmore and in 1941 took part in the Siege of Tobruk in Libya. From Tobruk he moved to Egypt to fight at the Battle of El Alamein in 1942 becoming one of the famous Desert Rats. After returning from the Middle East, Harry undertook further training in 1943 in jungle and amphibious warfare before being deployed overseas yet again to Lae in New Guinea. Returning home in 1944 he was then posted to Ravenshoe in Northern Queensland for further training and in 1945 was sent to Borneo where he took part in the Landing of Tarraken. 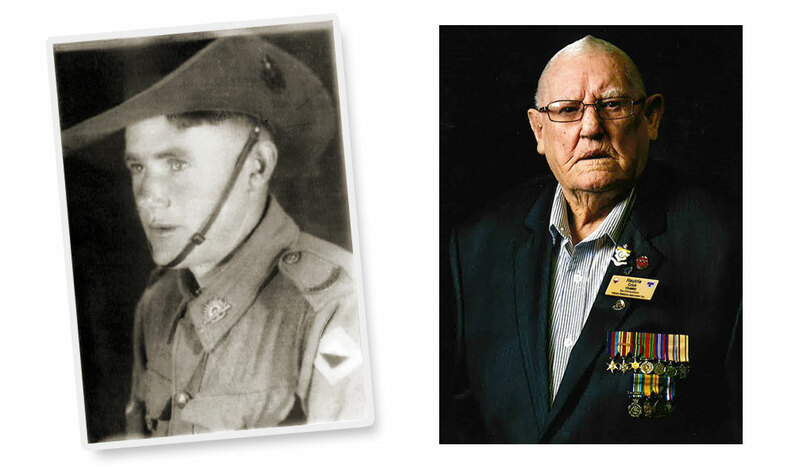 Since his discharge from the Army in 1945 Harry has been a very active member of the Returned Services League and 2/24 Australian Infantry Battalion Association where he was honoured with a Life Membership at the age of 98 years during a reunion of the Battalion in Wangaratta in 2017.